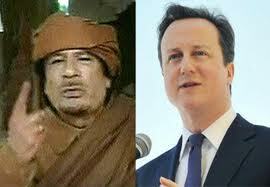 Gaddafi, time to sally forth? The quizzical expression on my face intensified. This brief exchange with my boss revealed that my command of the English language had not reached the required levels of Dickensian elegance so typical of the bar in England. As we left King’s Bench Walk for a mid-morning latte, I noticed that both the red top and broadsheet newspapers bore news of the Libyan war and advances made by the rebels in Tripoli. There is much excitement, not least on the part of UK Prime Minister David Cameron. “This has not been our revolution, but we can be proud that we have played our part,” said the Prime Minister. It is interesting that just a week ago, Cameron was slamming those who participated in the London riots which spread throughout the country. Yet, in spite of his own twisted motivations, Gaddafi too would say that the rebels were rioters. Obviously, to draw such a parallel would be simplistic. The rioters in Britain have not suffered under dictatorship and repressive government, quite unlike the rebels in Libya who claim to be fighting for a free and democratic Libya. But who decides which revolution is legitimate and that which is not? Although the rebels in Libya claim to be going it alone, it is clear that they would not have managed without the support of NATO, led by Cameron and Sarkozy. Without a doubt, the sun appears to be setting on the Gaddafi regime and before we know it, it will be time for him to sally forth. The more fundamental question however is, who will take over? What sort of regime will be in charge? Will Libyans have full control over their oil? Or will they have a debt to pay to the true sponsors of their revolution? ← No means yes and yes means…rollerblade bopping!